"You never know what you got 'till it's gone." I never realized when I was younger just how true that statement was. You know how children are. They typically think about the here and now. They only see as far ahead as tomorrow. They don't really think about other people's feelings and needs except for their own. As they get older and become more mature, the light inside of their head goes off and suddenly, "You never know what you got 'till it's gone," is as real to them as ever. They suddenly become aware of the people in their life. They become aware of their parents, grandparents, aunts, uncles, brothers, sisters, and so on. They become more aware of other people's thoughts and feelings. They realize that their family isn't in their life to be there on every beck and call, but that they love them unconditionally. I realized that everyone was not blessed with a good home life, but I took my own good home life for granted. When I got older, I realized that too. I became aware of just how blessed I was to grow up in the family that I have. It is often very easy to take those you love for granted. In your mind, you assume, that they'll always be there. The truth is, your family won't always be there. Things happen. Life is short, but it goes on. We have no clue what tomorrow will hold. So many things can happen in the blink of an eye. 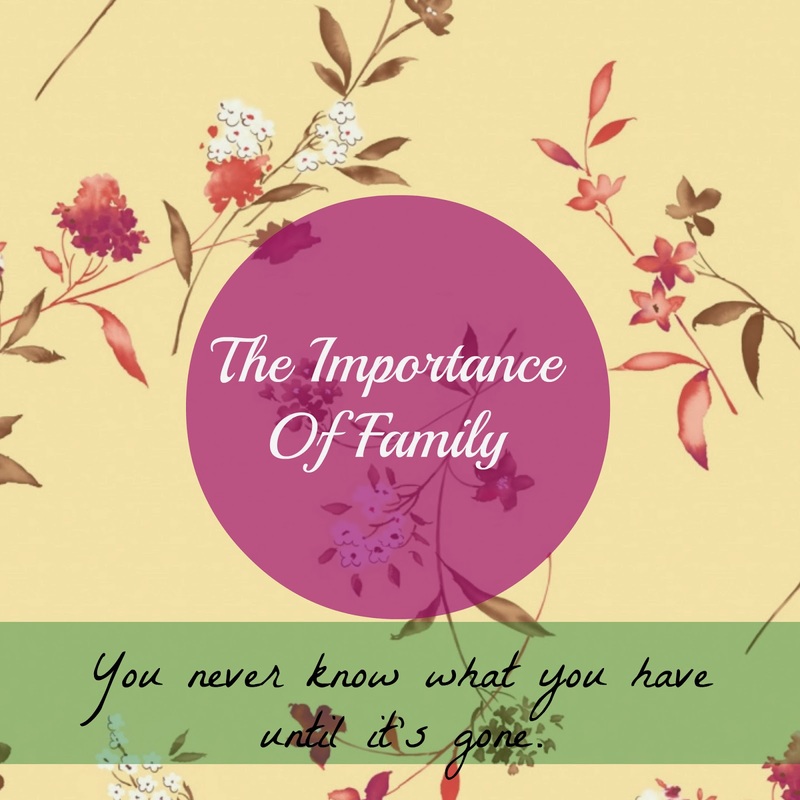 I've always loved my family, but I didn't really know what it meant to fully appreciate them and spend time with them. I had always wanted to spend time with my friends instead. I'd go spend the night at my friend's house when my dad was off from work instead of spend time with him. How completely and utterly foolish I was. The thought of family being important hit me again hard. Real hard. My granny passed away on July 19, 2013. It was heartbreaking. She was and still is the best woman that I have ever known. She was the definition of a Christ-like lady. She never once spoke a mean word about someone. She treated you like you were wonderful and special no matter who you were. Even if she didn't know you, she was the kind of person that made you feel loved. She was a prayer warrior. She was all of these things and much more. A while after she passed away, I learned even more things about her. She apparently used to keep journals filled with funny little things that we (her grandchildren) would say and little things like that. I've always been close to my granny and papaw. There were still so many things that I didn't know. When she still had her mind, she would tell me things about her siblings and things about people that she knew. She would take me in the bedroom and show me beautiful black and white photos of her family and people that she knew. Granny always LOVED photos. There isn't a room in the house that doesn't have a photo in it. Photos were special to her and she treasured them like gold. In fact, her exact words to us were always, "You are more precious than gold!" She loved her kids, grandkids and great grandkids so much. I was always shy, and I still am, but I'm so much better than I used to be. I wouldn't talk a whole lot and ask her many questions. If I knew then what I would know a while into the future, I would be talking to her as much as I could. I didn't realize how special and wonderful it was for Granny to have her mind. She would always remember to put a piece of cheese on my sandwich and she knew how I liked my food. She knew what I liked to play and what I liked to do. I took everything for granted. The thought of Granny one day not knowing who we were half of the time never crossed my mind. I feel sad to think of all those times that I did not sit there with her and appreciate her beauty more. She was always smiling, never judgmental, and always comforting. When you're a kid, you don't stop and appreciate things. It's heartbreaking, but you just don't. All of these reasons are why family is so important. You may think that your parents will always be here and that you'd rather spend time anywhere but with them. Please don't think this way. One day, you will look back on all those times that you never got to know your parents. All those times that you never spent any time with them. All those times when they were excited about something and you could care less. You WILL look back on everything and feel sad when you realize that you had a great, wonderful thing. Too bad you didn't realize what you had 'till it's gone. So, do what you can with your loved ones. Appreciate them. Learn from them. Care about their feelings and needs. Talk to them. Love them, because life is short and nothing is promised. What a beautiful post and so true! I think we all have regrets about something that we failed to do or meant to do but waited too long. I miss Mom so much. Things are just not the same without her. I love you Jess. That was a very moving and true post.